Facebook announced Thursday it is officially axing a privacy setting that allowed users to shield themselves from searches by strangers. Still hiding in Facebook's shadows? Not for much longer. The company announced Thursday it is officially axing a privacy setting that allowed people to hide their profiles from other users in Facebook's search field. 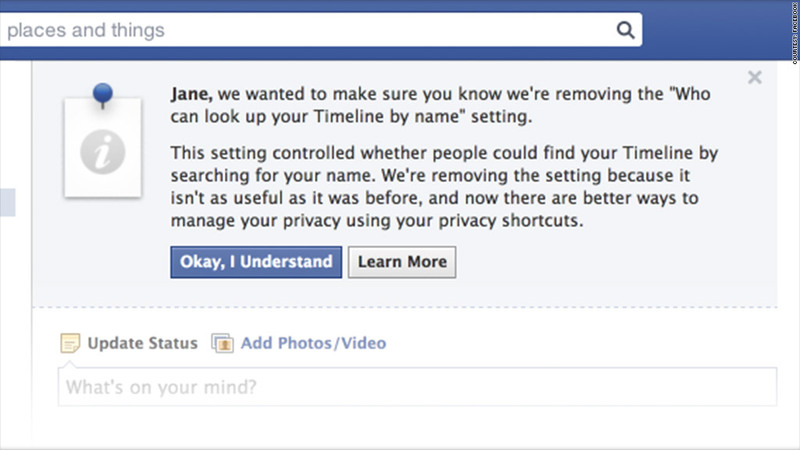 The setting "who can look up my timeline by name" had already disappeared from the options for some users -- specifically, those who weren't using the feature in December of last year. Thursday's change affects a "small percentage of people" on the site who were still using the feature, Facebook (FB) said, although it did specify how many of its 1.15 billion active users were impacted. Facebook explained that the tool was outdated, because users could be found in other ways, either by clicking on their name in a mutual friend's Timeline or News Feed. The social network also said people became confused when they were unable to find a friend via search. It's the latest development in Facebook's long-running privacy saga. Frequent changes to its privacy settings have confused some users, and controversial statements from CEO Mark Zuckerberg about how people shouldn't be doing the things they want to keep secret in the first place. Earlier this year, Facebook expanded its internal search capabilities with the roll out of Graph Search. The feature allows users to sift through the social network's vast data trove to find "friends who live in my city," "tourist attractions in Italy visited by my friends," and similar lists. It also allows Facebook to eventually challenge sites that rate and rank local attractions like restaurants and hotels. Facebook noted in the announcement that it provides other privacy settings, including control over the visibility of each individual post.